Some times you have to get older clients to talk to newer servers, and this was the situation I was in recently. 2 new SharePoint 2016 Farms has been build (Pre and Prod) on Windows 2016 – same server build and same SharePoint build, both running over SSL. This article seemed to suggest that the issue was based in the TLS settings on the Windows servers as Windows 7 by default will only support TLS1.0. According to IISCrypto both systems fully support TLS1.0 – but clearly something was different. A lot of organisations are moving to newer versions of TLS and Windows 7 does has an update to allow it to work with later version of TLS, but in this instance we didn’t have time to test and release an update, so it was time to fire up Wireshark and do some tracing. 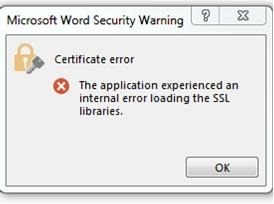 From Win 7 client opening a Word doc against Prod. A bit hard to see but we were getting TLS1.0 Handshake Failures when using Office 2013. We tracked the issue down to the Ciphers used at Load Balancer level – once this was updates everything worked perfectly.